If you haven’t realized by now, we here at A2 are massive advocates for any gun that isn’t an M4 – We miss the days where your local field would be jam packed with a variety of guns. We really like our Obscure Rifles, so we felt like we’d keep on expanding our range of weird and wonderful rifles for you all! S&T Beretta AR160 EBB & Sportline. You know Beretta right? The guys who make the Iconic M9/M92 Pistol? They Make Assault Rifles! And we’ve got replicas of them! 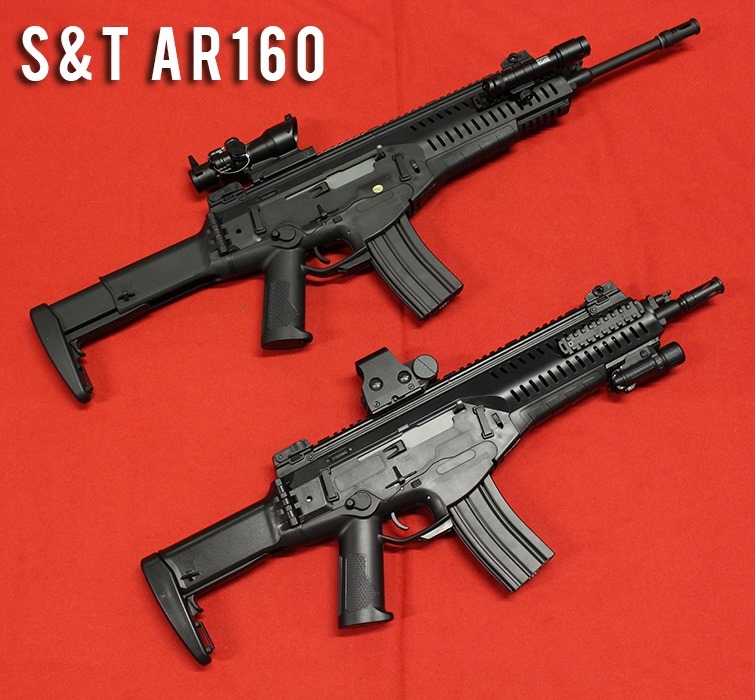 Now in store we are carrying a few of the S&T AR160 Rifles to spice things up a little bit. These unique looking rifles come in a number of versions/variants, in store currently we have the Full Size Electric Blowback and the CQB Sportline. First up we have the EBB, which features a full length barrel and a Nylon Polymer receiver which feels like the real deal. Like most modern Rifles it is festooned with railsfor the mounting of optics and accessories to give you that tactical advantage. These Rifles also feature comfortable and retractable folding stocks. 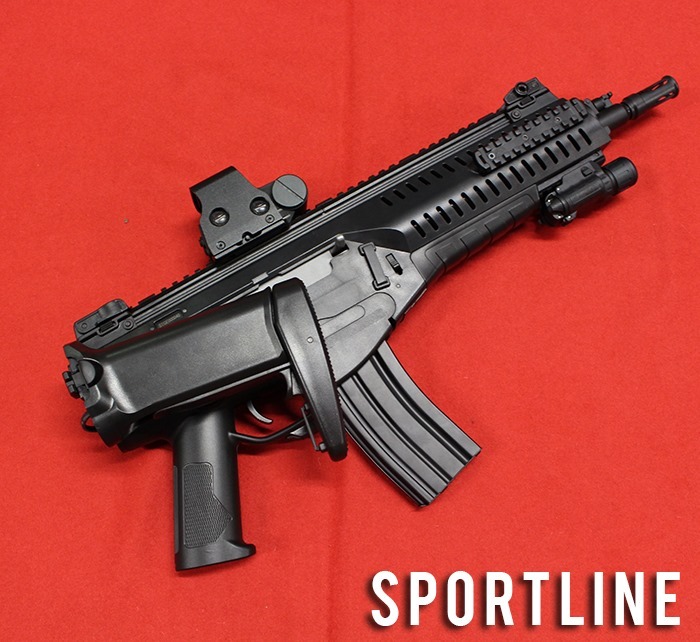 Moving onto the Sportline, these Rifles are a more affordable option for those of you wanting a weird and wonderful rifle. Although these versions do not feature Electric Blowback, they are still comfortable to holdand shoot great out of the box! We currently have this version with the CQB barrel in store. These Rifles run off of the good old M4 Style STANAG magazine whilst maintaining their own unique flair! 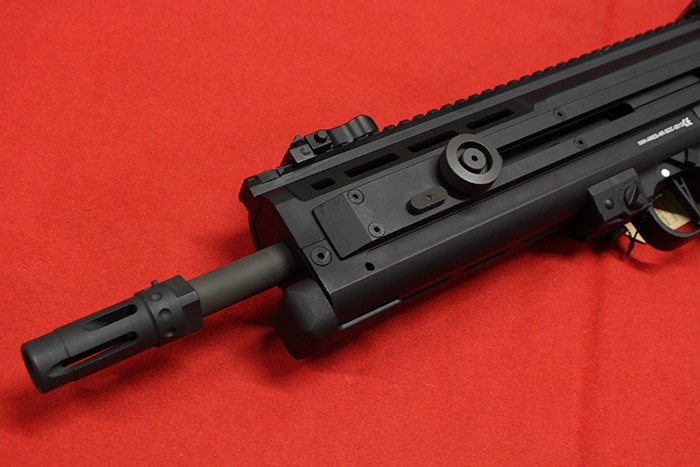 Brand new from Ares we have the Funky and Futuristic looking SOC-AR AEG. 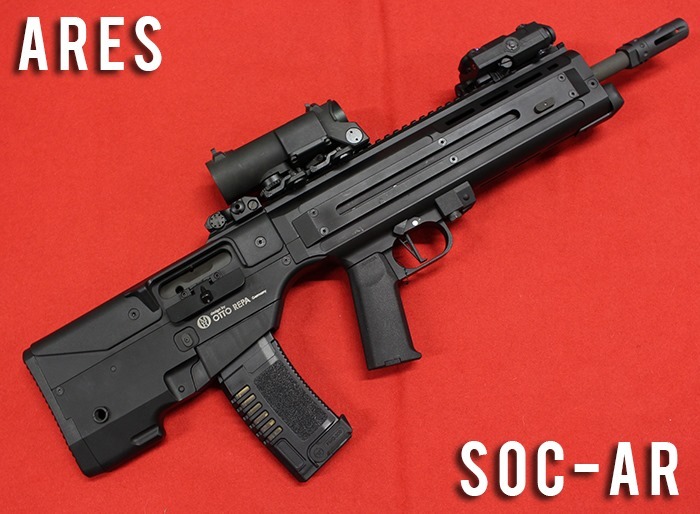 SOC-AR is the modern bullpup assault rifle based on SOC sniper rifle, which is a collaboration withOtto Repa OMR, one of the best gunsmiths and designers from Germany. 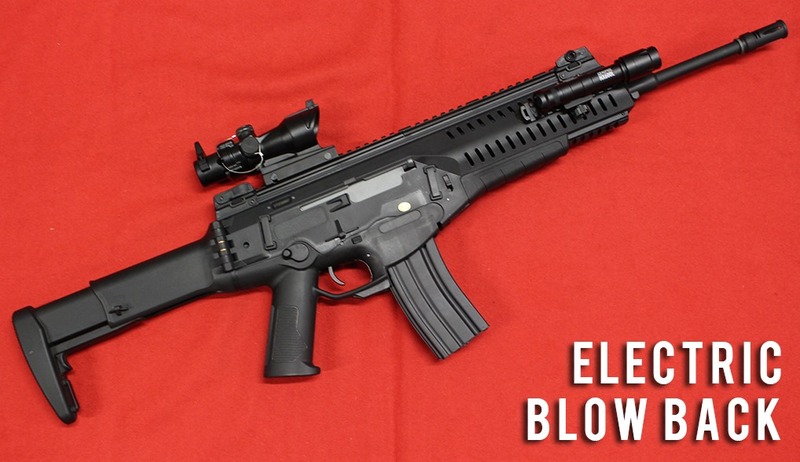 This incredible Full metal Bullpup Rifle features outstanding Amoeba Internals with a crisp trigger responseand overall fantastic performance out of the box. The Rifle has 3 firing modes: Semi-Automatic, 2 Rounds Burst and Full Auto, with a separate ambidextrous safety catch located above the trigger. Coming equipped with a monolithic top rail for any Optics and accessories (Such as PEQ boxes) however this is the only rail present on the rifle. The Best part about this AEG is that it still takes standard AR style Magazines! 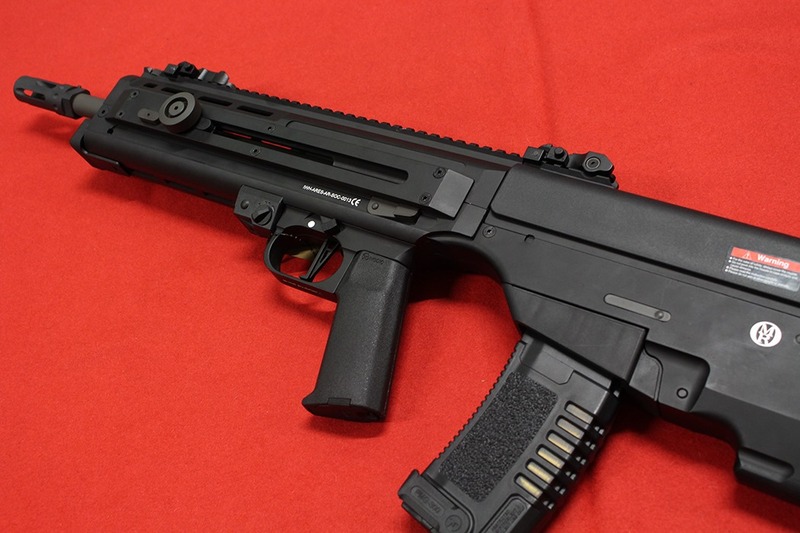 This is by far one of the coolest guns we have in store at the moment! Airsoft support guns! Yes They’re Heavy, Cumbersome and require a lot of attention.. but man do they look badass! 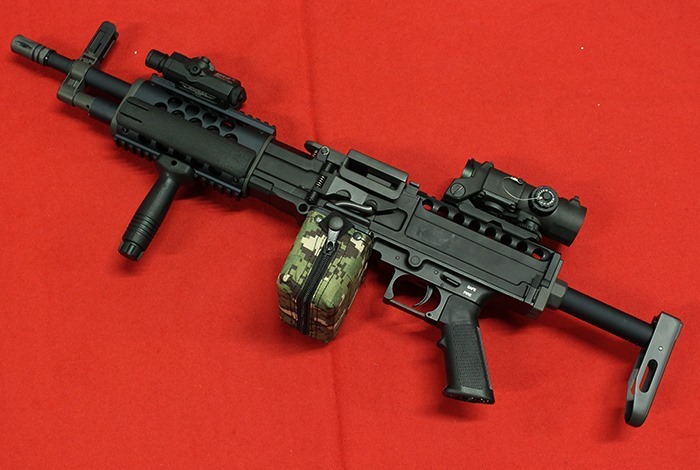 With a Wave of M249s and M60s already out there, perhaps its time for something a little different? How about a Stoner? 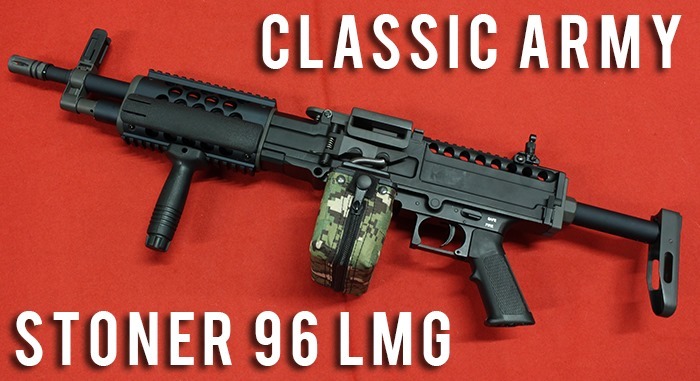 The Classic Army Stoner 96 LMG is a fantastic alternative if you’re looking for something solid, but also smaller than the standard M249. This modern LMG is both Lightweight and very easy to Maneuver; perfect for charging around on the field with. 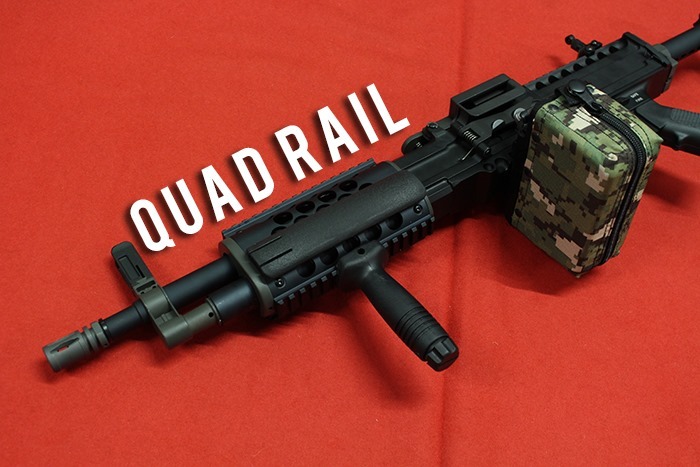 It features full metal construction, with a quad rail system up front for Grips Or Bi-Pods (or maybe Grip-Pods) Alongside a top rail for the mounting of Optics and accessories. Coming equipped with its own 1200 Round Drum magazine, this gun is more than capable of putting out immense firepower on the airsoft field.